Today, I step outside my comfort book and touch upon a topic I don’t know too much about: fitness. High intensity interval training, to be exact. 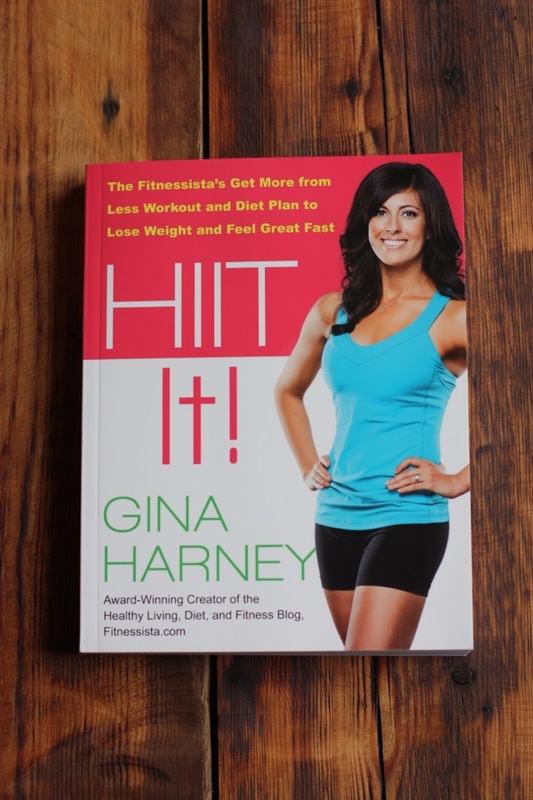 The book is HIIT It!, the new title from my friend Gina (whom most of you probably recognize as the author of the popular blog The Fitnessista). 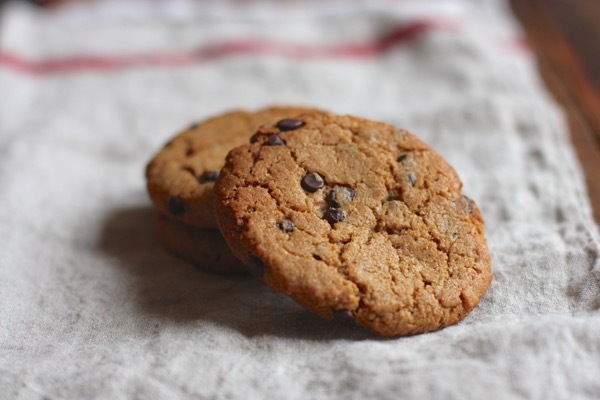 In spite of the fact that this subject does not at all fall under my expertise, I’m excited to tell you about the book, and to share with you a recipe for Gina’s scrumptious, whole grain, and 100% vegan almond butter chocolate chip cookies. I first met Gina in 2009, right after I started my blog. 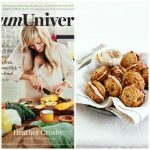 We immediately connected over our love of raw food (Gina had just studied at 105 degrees academy and was sharing a ton of raw recipes on her blog), and over time we stayed in touch (we even ended up rooming together at a conference once!). I’ve always admired her welcoming and humorous approach to writing about fitness, and in person, I’ve always loved her warm heart and generous spirit. When Gina asked me if I’d be interested in writing about her new book, I offered her a full and frank disclaimer that I’m not necessarily the target audience. I have a pretty narrow fitness routine (mostly yoga), and I don’t really love strength training or interval training. For me, movement is all about doing what feels genuinely enjoyable, so I don’t give too much thought to the workouts that don’t speak to me. Gina told me not to worry, that she wanted to share with me and with my readers if only because she thought I might dig some of the vegan recipes and meal plans in the book. She was totally right, and I’m so glad that I’ve had a chance to read this comprehensive gathering of so much of the information she’s been sharing on her blog for years. In fact, the fact that I’m not a target reader is what made reviewing this book refreshing and enjoyable! I had a lot of fun reading through Gina’s introduction and opening sections, a strong case for why HIIT training can be beneficial and strengthening. Gina points out that doing high intensity intervals can be fun, can keep you constantly trying new things, which in turn leads to greater strength and agility. Other benefits include fat burning and metabolic increases, which I was less focused on as a reader, but as someone who does pretty much the same forms of movement all of the time, I took her point about variety to heart. I was also incredibly impressed with how clearly and accessibly she spells out what HIIT training is, and grateful as someone who is a HIIT novice that she also took the time to encourage readers to take things slowly. So many fitness resources, it seems, advocate intensity and “pushing your limits” at all costs; it’s nice to read a fitness book from someone who encourages small steps and lays out plans for beginners. She also includes a whole section about getting back into fitness if you’ve been out due to injury, childbirth, or any other reason, and her main emphasis is: take it easy. Be gentle on yourself. The book explains major muscle groups, contains stepwise photographs of all of the major exercises, and includes sample workouts, instructions on crafting an individualized training plain, meal plans, and more. As far as the meals go, they’re whole food based and well rounded. Gina includes recipes from breakfast to lunch to snacks to dinner. She also advocates balance, not getting too strict or too rigid. A lot of my nutrition clients tell me about experiences with fitness plans that advocated extremely strict macronutrient ratios or eliminated a wide array of food; I like that Gina seems to encourage everything in moderation. The book is not vegan, but Gina includes plenty of vegan options, and she makes a point of saying that it’s a myth (sometimes more prevalent in fitness circles) that vegetarians and vegans can’t get enough complete protein. She includes a list of her favorite protein options, which include nuts, legumes, nutritional yeast, and protein powders. My favorite vegan recipes in the book are Gina’s Banana French Toast, Quinoa Power Salad, Deconstructed Sushi Salad, Cashew Avocado Salad (yum! 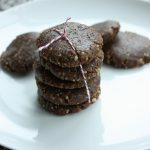 ), and the almond butter chocolate cookies I’m about to share, which grew out of a popular recipe on Gina’s blog. 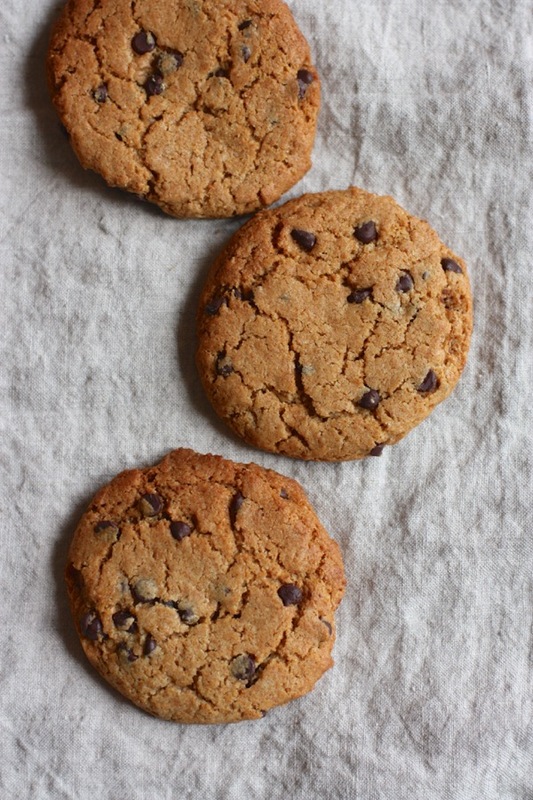 I made them, shaping the dough into six larger cookies instead of the recommended dozen. They were delicious, and I know you’ll all love them. 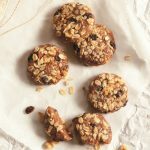 Almond Butter Chocolate Chip Cookies from Gina Harney’s HIIT It! 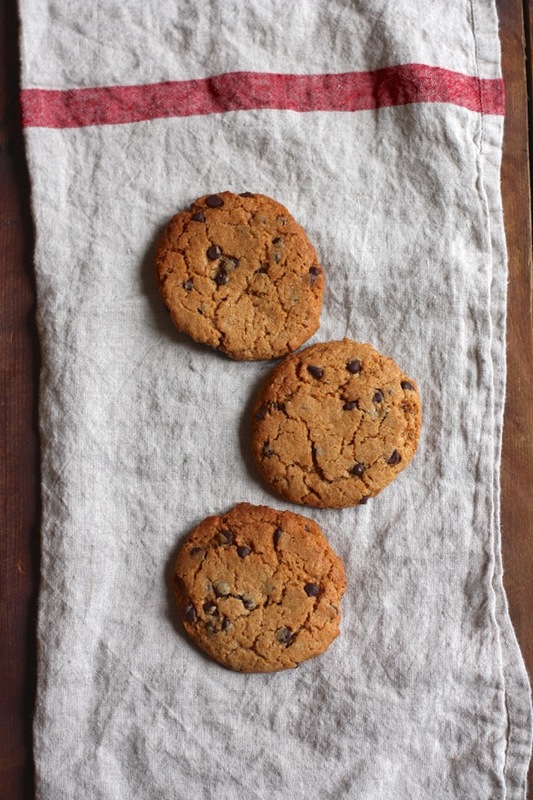 Preheat your oven to 350F and line a standard cookie sheet with parchment paper. Combine the flour, baking powder, cinnamon, baking soda, and salt until thoroughly mixed, and then add your chocolate chips. Stir to combine. Combine the maple syrup, almond butter, canola oil, vanilla, and molasses in a separate bowl and add to the dry ingredients. Form ball-shaped pieces of dough into slightly flattened cookies on the baking sheet. The mix will be sticky, so do what you can. Bake for 11 minutes, remove from oven and allow the cookies to remain on the baking sheet for one minute longer, then transfer to wire racks to cool. Seriously yum–and not hard to make. I loved them. Will I take up HIIT Training soon? In truth, probably not–I know what my body loves, and for better or for worse, I stick to the movements that give me joy. But I’m glad that I know more about HIIT training, thanks to Gina’s wonderful clear and comprehensive book. 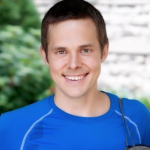 I’m a nutritionist, and I should be able to keep up with my clients, many of whom do some form of HIIT work. And besides, it’s fun to learn. If there’s anyone I’d like to guide me through a new sort of physical fitness, it’s Gina, with her sunny attitude and down-to-earth approach. If you’re interested in learning more about Gina’s book, you’re in luck: I’m offering one lucky US reader a giveaway copy. Enter below to win! Good luck, readers, and thank you, Gina! It’s been a jam packed day with clients, and now Steven and I are preparing for a quick trip to Telluride, where friends of ours have invited us generously to stay with them. Speaking of Steven, he has been crafting a second blog post as a follow up to his first one, and I can’t wait to share it with you — he’ll be rounding up a bunch of his favorite recipes that we’ve enjoyed at home together. Stay tuned, and have a great night. Running of course! I don’t even consider it exercise because I truly enjoy it! Dancing! It’s absolutely not exercise in my book, but it also actually is – perfect. I’ve danced since I was 4, and I plan to keep going as long as I can. I love dance or yoga the most! I love to run! I forget everything and am at peace! I love dancing and yoga. Dancing is so much fun and I love how my body moves and.feels transitioning into different yoga poses. Yoga, riding my bike, and walking are all favorites of mine. Those cookies look delicious! Always always swimming. I love how meditative and full body it is. My favorite form of movement is Pilates. It’s low impact, great for the abs and for strengthening the lower back, keeps the muscles long and lean, and I still get a tough workout from it (particularly with the Pilates Reformer, Chair, and Barrel equipment). LOVE IT. Hah! I like the idea of shaping them into a bigger size because sometimes the smaller ones are so easy to pop into my mouth and I end up finishing a batch much faster than I intend to! Although that’s probably just me! I recently made the change from daily running to daily yoga, and wow. My old self never would have been happy with “only” doing yoga everyday, but it has made such a positive change in my life, I don’t think I can go back. I have been enjoying yoga a lot more recently, Usually the day after I do one of Gina’s HIIT workouts from her YouTube channel. Love her blog and so glad her book is now a reality! Yoga! it has shown me the strength, power, and beauty of the human body! Walking, hiking, and barre3, which is a nice balance of pilates and yoga. A lot of the barre methods seem intimidating to me, but barre3 has been a very safe and challenging with the main focus on pilates and yoga and the “barre” is less ballet and more using a chair for balance. I love it! I love kickboxing, unfortunately that fad has passed and it is difficult to find a good class. I also love running, you can do it just about any time, any place….make it a social thing, run errands, solve the worlds’ problems in my head…. I love to run. It’s so freeing and I get such a rush. Thank you for the wonderful giveaway. Burpees of course. Bitter Sweet full body move. Running has always been my favorite. Running trails with my dogs is the best of the best. I love running because of the way it makes me feel and how it connects me with others who also love to run! I haven’t been able to do it for awhile because of knee issues, but I love going for a long run outside. There is nothing better than feeling the wind on your face and the sounds of the city as you tap out your own rhythm on the pavement. Running, it’s an amazing way to explore places and invigorate yourself. i’ve recently taken up running but i guess dancing is my favorite! I have always hated exercise of any kind! It stems from having always been the one at the back of the PT class who always failed at everything and was always the last to get picked for any team. I couldn’t wait to leave school and leave all that behind me! Now in my 50s I realised that if I didn’t start doing something physical I would atrophy. I took up resistance training specially for women. I wouldn’t say I loved it, but it was better than anything else I’ve ever tried and I certainly feel the benefit. Skiing downhill or on skate skis – I love the feeling of flying through a snowy, wintry wonderland and being hyper focused on the present moment. Your mind can’t be anywhere else when you’re going that fast on snow! It also makes my body feel strong and graceful, which is a feeling I cherish. I love barre classes, because it is a gentle way of staying toned and flexible. My favorite is a hot and sweaty bootcamp with heavy weights. My favorite form of exercise is riding my horse. If you don’t think that’s exercise, you’ve obviously never tried it. Besides, lifting water buckets and hay daily is a great upper body workout too along with all the shoveling of manure, walking through the field uphill to the ring, running after my daughter and her pony, etc. I love yoga and running! I love walking! It always uplifts my mood and just makes me feel great! I love lifting weights because it just makes me feel strong. I love martial arts. I feel strong and in control, and at the same time it’s relaxing and fun. I love running most but need to balance it with yoga and weights so I don’t get hurt! Ekk! So many great things going on in this blog post:) I’m with you on the exercise, I have to do what feels right but I love Gina’s site, so I bet I would enjoy her book. And those cookies YUM:). P.S some how I missed your BF’s Blog post and am so excited to check it out after this. That’s awesome that you’re coming to CO! If you ever make it to Boulder, send me an email and we can grab some green juice 🙂 I just got my copy of HIIT IT a few weeks ago and I really love it. I never thought that I’d be interested in this type of fitness, but I’ve been incorporating a few HIIT workouts into my routine and I love it. What I appreciate about both you and Gina is that you’re both such wonderful advocates for making things work for you. I like the balanced approach that both of you give when it comes to both food and fitness, even if it looks differently for each of you! 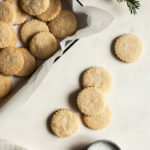 I have yet to make these cookies but this post is a great reminder to on this snowy day! Have a safe trip! Hiking because outdoors is wonderful. Dancing!! Or Zumba! Both are fun and make me look forward to exercising! Yoga because I feel so relaxed afterwards! My favorite form of movement is yoga, although I don’t do it nearly enough! After I was diagnosed with fibromyalgia, yoga was the only thing I could do that wasn’t putting a lot of extra stress on my body and causing pain. We are opposites in the fitness world ;p I LOVE HIIT and everything like it. I have tried yoga soooo many times and I just can’t get into it, try as I might. I want to love it so much!!!! But I really don’t ;p My body loves running and cardio and strength training. Sounds like the book for me! My favorite movement is walking. I love walking long distances, and I always try to not take the elevator. Running! Although yoga has become a close second. My favorite form of movement is sprints! I’m always surprised when I have more juice in the tank after a long run. My body continually impresses me with it’s higher limits of intensity. I love running – it’s such a great way to relieve some stress. I’m a runner to the core. Sets me free in so many ways! I love any kind of dance! I have been doing some interval training and like that ‘rest’ period too. I am mostly a walker or swimmer because it’s meditative and helps with my anxiety. I like to alternate HIIT via Jillian Michaels with strength training. But this book looks very interesting! Swimming Laps! I also love yoga but haven’t found a studio in my area that I enjoy going to. Hot yoga – feels so good! I do mostly running and weight training at home. Mostly because I live in a small apartment and it is cheap. Running! It’s my therapy, lol. I love running the most, but I enjoy almost every type of sport. Even though I’m in 12 grade in High School (in Germany) and have my huge final exams in two months (known as the Abitur) I pretty much spent the last two years doing 3 h of exercise per day on avarage (mostly running, riding my bike to school and back, functional strength, skiing, swimming, soccer,… and a ton more). I do admit that I’m sometimes putting too much pressure on myself, but usually, sport gives me the balance I need compensating the long hours studying. Sports make me happy, and together with plant- based food it’s just great!!! I love running, but have also started to love doing HIIT workouts since they are fast and effective! My fave type of movement is definitely teaching/instructing group fitness classes and lifting weights! I love yoga, because it is fun to do arm balances and inversions! not a big fitness win but walking on the treadmill while reading is divine! I love all types of movement because I am indecisive. Some days I love yoga, some days I love a Plyo HIIT workout. Movement in general just makes me feel right! I love running and recently started a training plan to better my race times. I love running and taking long walks with my dog! Going for walks is my favorite. speed work in running and cardio kickboxing!!!! I love running because it makes me feel so free but I also love yoga for the calming nature of the moves. I love running! It makes my heart happy! I love the combo of HIIT and strength! My favorite type of movement is dancing. It’s great exercise without feeling like exercise. Dancing. Period. It never feels like exercise. I love nighty walk and talks with my mom…and then we stretch together after! Dancing, but due to sequels of chikungunya (pain in joints) I am taking it easy. But I walk a few miles everyday. I just made these!! They turned out great first time around. Thanks for sharing a wonderful recipe!! I love yoga, hikes and bike rides. Love to be out in the fresh air!